What\'s difference between V116 and V117? The V117 max efficiency is 98.2%. ​ The V117 MPPT track speed is 5 times faster than V116. The V117 Charging Voltage Accuracy is ±0.2. 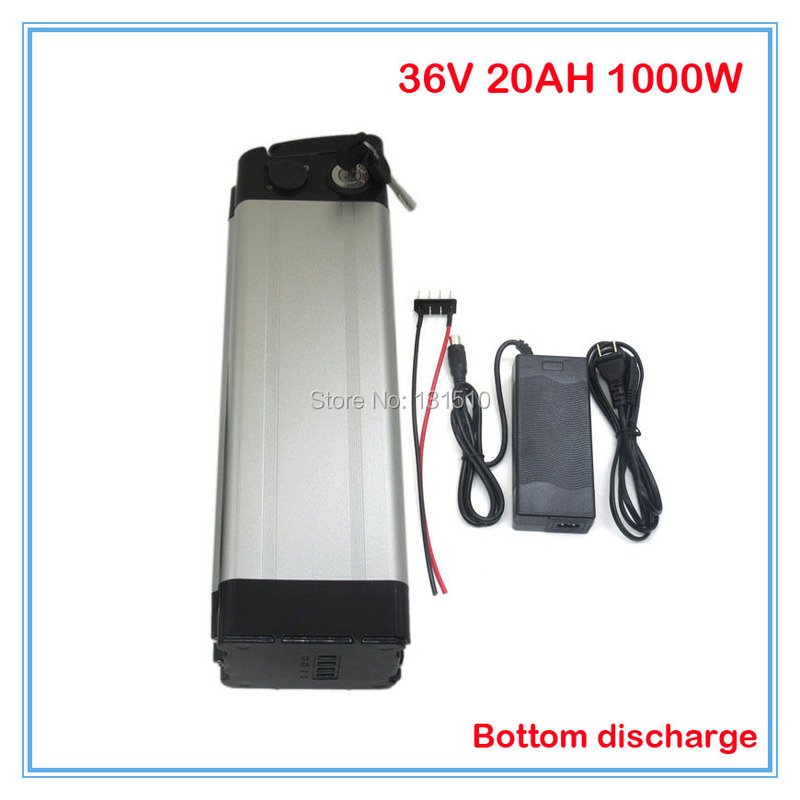 The V117 is better to charge lithium battery. Notes: The V117 version motherboard is different to V116 and current it\'s no logo on the motherboard. ​Most of clients like the V117 version. 80A Plus: Two pcs 40A to be in parallel as 80A. 100A Plus: Two pcs 50A to be in parallel as 100A. 120A Plus: Two psc 60A to be in parallel as 120A. 150A Plus: Three psc 50A to be in parallel as 150A. If you need the 96V 30A or 45A controller, please contact us directly. 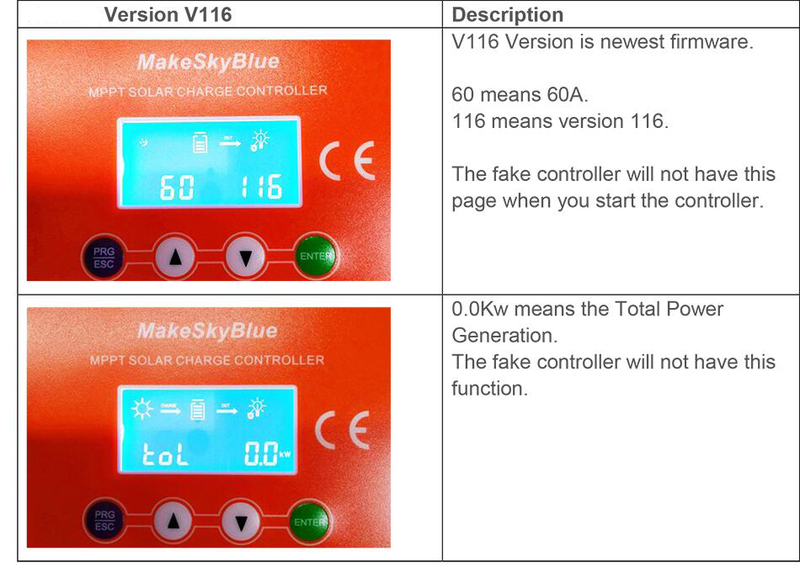 Thank you for your trust of our products, to protect our clients and our brand, we updated the firmware to be newest version V117 and you can clearly find this version when you turn on the controller and also you can find the page with Accumulated Power Generation on LCD. ​The copy ones on the market is V113. Please choose the newest firmware since that is much better than the copy product. The copy one said it\'s V210, in fact it\'s still old version since they just copied our old version and don\'t have ability to upgrade anything. If the copy company didn\'t have V114, V115, V116 or V117, how to upgrade to V210? It\'s rediculous. Care it. V116, please see details as picture. There are some fake products on the market including Amazon, Ebay, Aliexpress and Alibaba. We\'ll not provide the warranty for counterfeit and it will be risk for your battery. Please see the details as below to help you find an original one. But if you buy a fake product, the version will be V113 as below picture. When you turn on the controller, you will see this version number in the beginning. Please report to us and we\'ll give you the better price. The intellectual property rights needs your support and all of our effort in the world. The V117 version output terminal is for 5A DC loads ( 12V system less 60W, 24V/36V/48V system less 100W ), and the old types only can connect lamp. 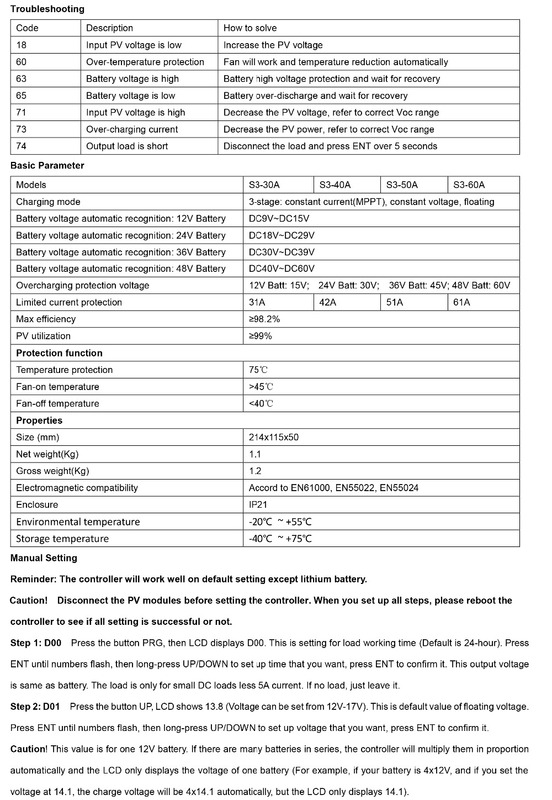 The output for battery is no polarity reverse protection. If your load device is shorted or over-current, the controller will start output short-circuit protection to close the output condition. When you disconnect the load and press ENT over 5 seconds, then output will turn on again. Please note that 30A and 40A do not have this function. If your load device is shorted or over-current, the controller will have output short-circuit protection and close the output. When you disconnect the load and press ENT over 5 seconds, then output will turn on again. Please note the 30A and 40A don\'t have this function. 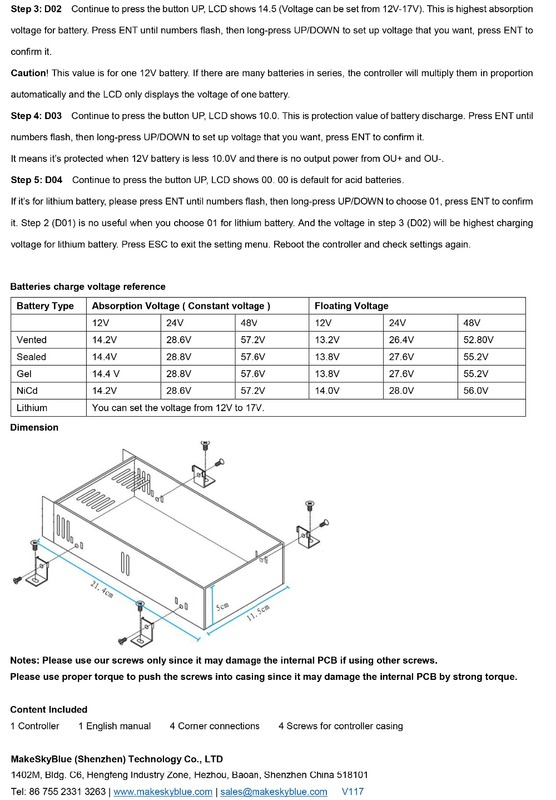 The MPPT output of the battery voltage will not rise suddenly, and the controller doesn\'t cause the output voltage to overshoot through the BMS protection board. 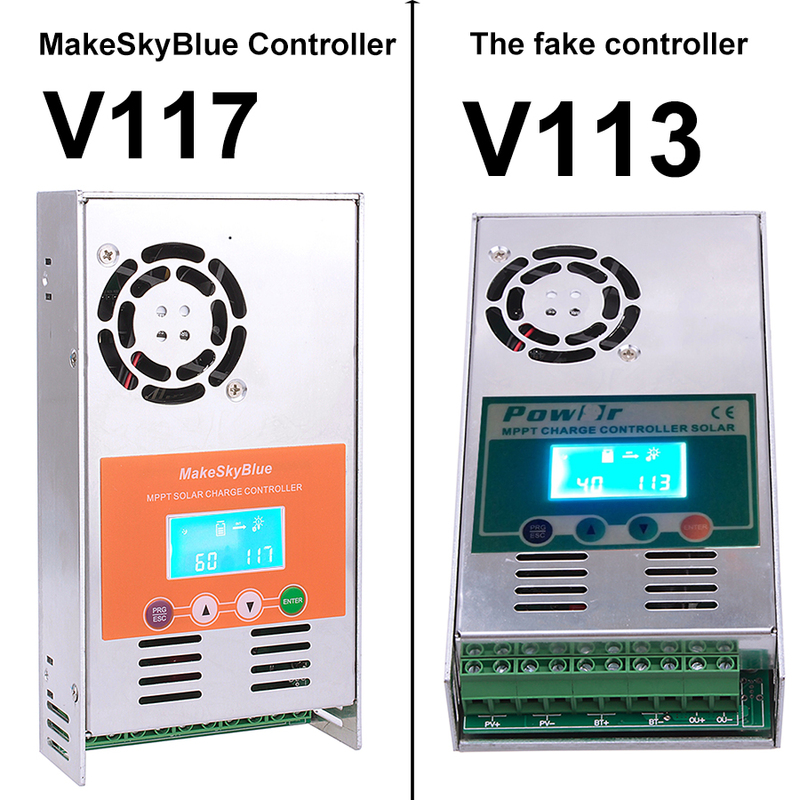 ​By the way, the charging voltage of V117 version can be set from 12V to 17V compare to the fake products is from 13.5V to 17V. 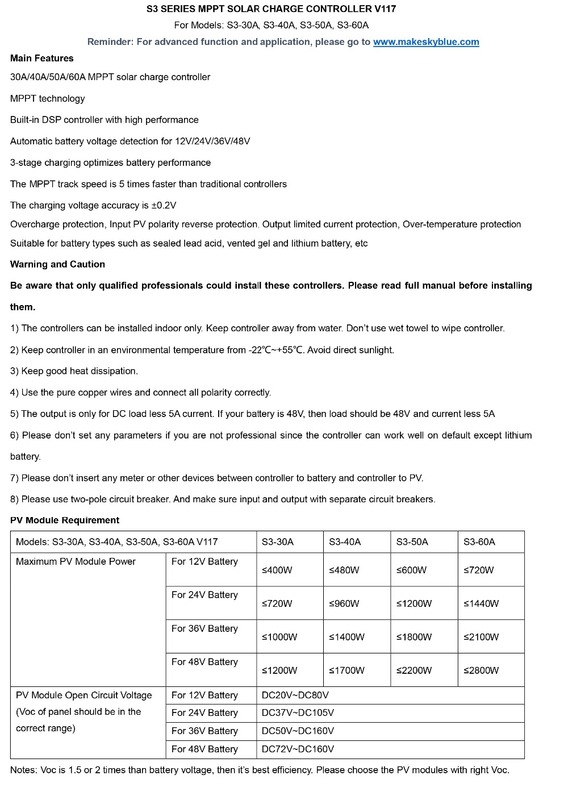 ​The discharge voltage can be set from 9.8V to 14V. 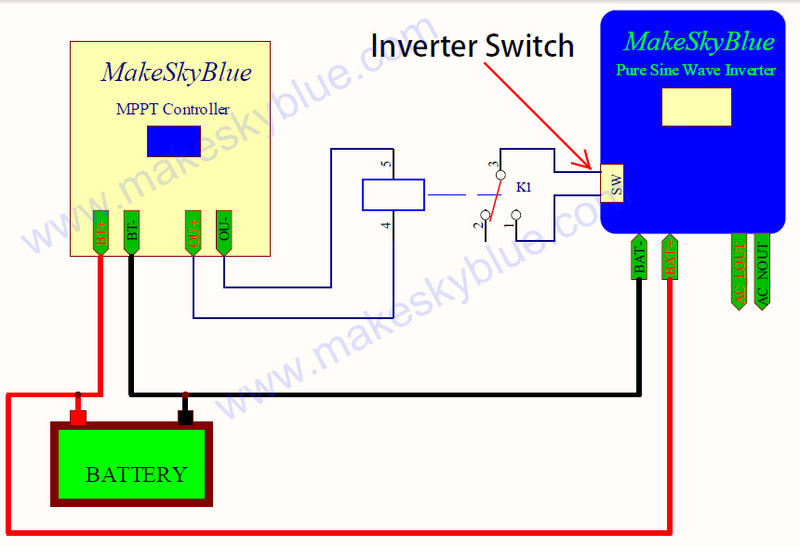 The time and light control for OUTPUT will be accurate when you connect the lamp or other DC loads less 5A. The fake product can\'t use the time and light control and can\'t connect other DC load except the lamp. Reminder: V117 can\'t be in parallel to V116 or other former versions since V117 is different motherboard. check it prior to placing an order if you don\'t have experience related. products and getting lowest margin. 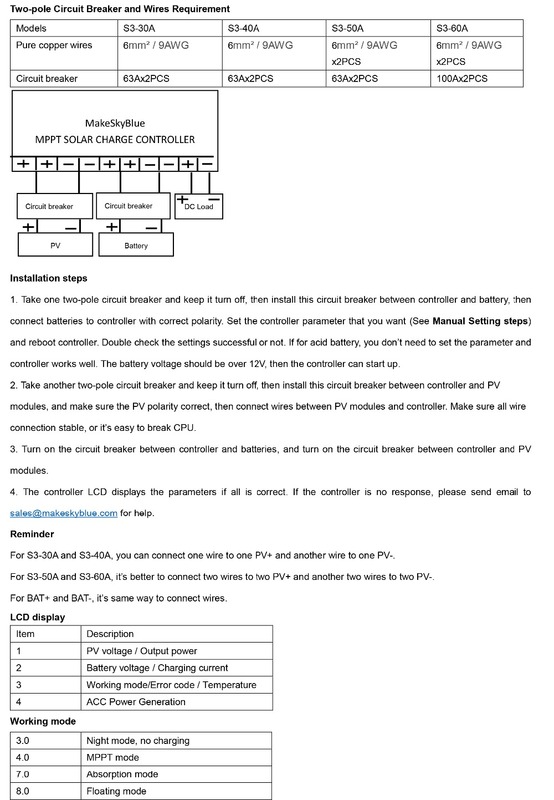 If you are not a solar technician or you can\'t get help from a solar technician, please don\'t install any of our products since these are professional products that may be damaged because of any wrong step. Please trust us we provide professional technology support for after-service that Aliexpress can\'t provide. Please take full video when problem happens and contact us directly. Please don\'t open the dispute since the Aliexpress is not professional for our products and they may make the wrong judgement that you may lose money. Contact us. Thanks. 1. The copy company will never provide 2-year warranty. Try to contact them after 5 months and they will provide you nothing since we have many clients told this. 2. If you go to eBayStore to search their copy product, you will find they only write 1 year warranty. Do you think one company has two kinds of warranty terms for same product? 3. That copy company also has a controller that it lists "compatible to PWM and MPPT". The truth is that it\'s real PWM. 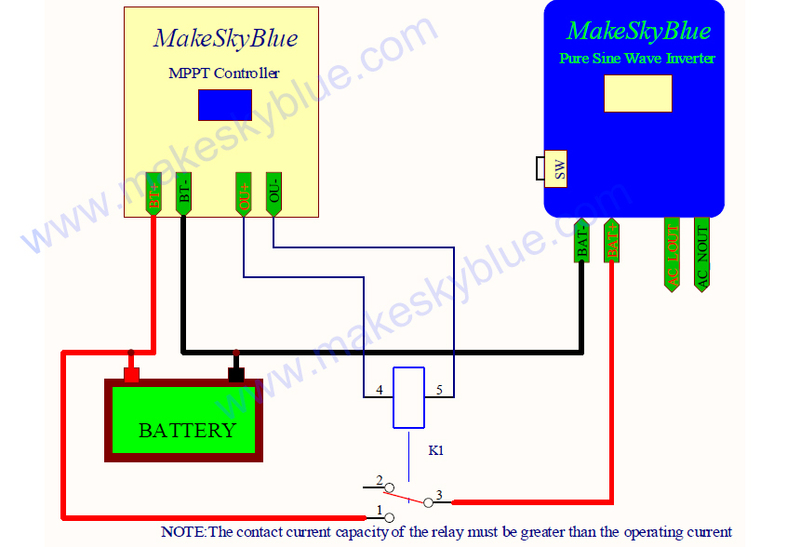 No controller is with PWM and MPPT. If you go to AmazonShop to search it, you will find they just write PWM since AmazonShop is strict. 4. The copy company can only copy one kind of our product since they don\'t have technology and coming soon we\'ll have 80A and 100A controller. Can they copy them again? 5. The fake products use the orange front panel without MakeSkyBlue logo before, and now they are using another brand with green front panel. If you are an old client, you might know this history clearly. 6. Why we sell this cheap price that it\'s close to our production cost? We can\'t let the fake products conceal the truth by marketing trick. 7. 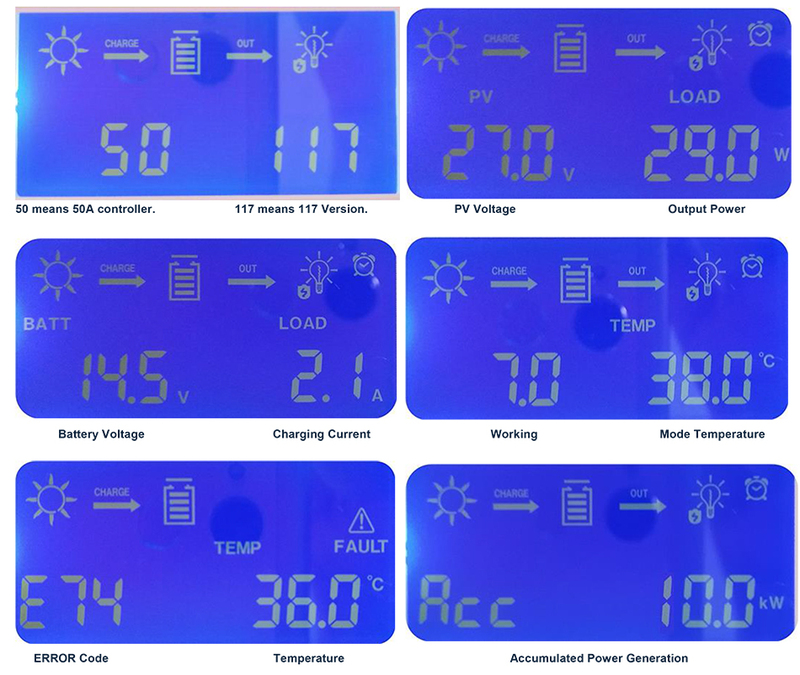 Our company spent long time to research these MPPT solar controllers and we also think the people in the wolrd support the innovative technologies and companies. The more products you sell, the more hurt for original innovation. As a copy company, how do you teach your staff and your family？ Can do everything for money as a thief?